Visitors to Arlington’s Downtown Library during April can experience two art installations. On the first floor, enjoy a photography exhibit by Ron Baseslice. Then head upstairs to see a blacklight installation by the collective eARTh focusing on the work of Charles Bukowski. Ron Baseslice’s photography exhibit Envisioning Spring is on display on the Downtown Library’s first floor. Baseslice is a photographer who has worked with black and white nature photography since the 1970s. Envisioning Spring features nine black and white photographs that take a close look at the world around us in the Arlington and north Texas community. This exhibition is made possible by Arlington Camera and will be available through April 30. 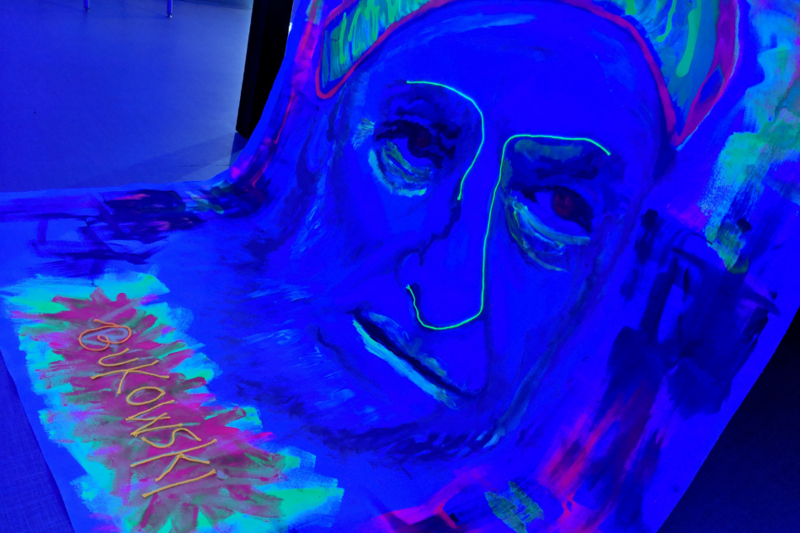 On the second floor, visit Bukowski in Blacklights, an exhibit by local arts group “the collective eARTh.” This self-guided, come and go experience immerses visitors in the works of German-American poet and writer Charles Bukowski. Quotations, poems and book covers are mounted on the walls and are highlighted with black lights and audio effects. The exhibit may not be appropriate for photosensitive visitors. Bukowski in Blacklights will be on display until April 19. After seeing these special exhibits, visit some of the Downtown Library’s other popular features. From the DISCOVER Wall and automated book sorter on the first floor to the rooftop Sun Club Garden on the third floor, each level of the library offers something delightful to experience. Click here for more information on the Downtown Library to plan your next visit.